Given recent incidents on campus, it is almost instinctive to view this plan as a reaction to acts of racism. However, to understand the larger implications of this initiative, we must consider it within the whole context of racism at AU over the past few years. The plan comes after several displays of racism at AU and the arrival of a new university president. First, there were the racist Yik Yak comments of 2015 that led to the creation of #TheRealAU campaign by The Darkening. The anti-racism group posted the racist comments on flyers across campus and shared screenshots of the messages online so that white students could not escape the reality in which their peers of color lived. The first “banana incident” came fall 2016. A Black student at AU reported that a banana was thrown at her, leading to the university’s investigation of two white first-year students. That brings us to 2017 and 2018. There were bananas hung from nooses last May that targeted Alpha Kappa Alpha Sorority, Inc.; confederate flag posters with cotton attached were found posted across campus in September; xenophobic stickers were posted on campus in January. And we still have three months left of the semester. 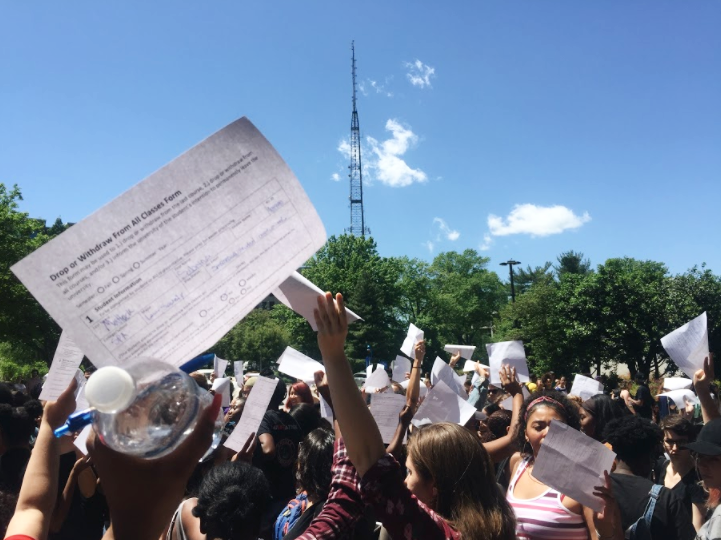 This is not meant to be a full recounting of every racist act at American University, for doing so would be fraught with omissions of the racism many students face on a daily basis. However, in looking at these high-profile cases of racism from 2015 to now, it is clear that a plan like President Burwell’s is long overdue. On Nov. 4, 2015, then-President Neil Kerwin penned an op-ed in The Eagle about the university’s insufficient response to racism on campus, most notably the Yik Yak incident. “Many in our community remain unconvinced of our serious commitment to create a truly inclusive and welcoming community,” the former president wrote. “They demand that we do more.” Kerwin committed to hosting a series of discussions with students, faculty, staff and alumni to determine a path forward. The following semester, on Feb. 29, 2016, Kerwin issued another memo, this time outlining five action items for the university to address racism on our campus. Those items included establishing the President’s Council for Diversity and Inclusion, introducing a mandatory course for all first-year and transfer students and proactively recruiting faculty of color for tenure or tenure-track positions. President Burwell’s plan comes after years of students, faculty and staff organizing, speaking out and fighting for a better university in the face of racism that continues to directly threaten the livelihood of people of color. The initiative cites the 2017 Campus Climate Survey, which states that compared to their non-African American counterparts, only 33 percent of African American students “feel included” on campus. The five goals of the plan address the pervasive nature of racism, highlighting that the issue extends beyond interpersonal interactions, spanning the institution itself and including its curriculum and culture. One of the more promising aspects of the plan is that the university is putting its money where its mouth is by investing $121 million through the fiscal year 2019. This money will help fund, among other things, scholarships with the goal of increasing access for students who otherwise could not afford to attend AU, “faculty development” and the American University Experience (AUx) Program. The program, which is a result of The Darkening's sustained activism, is a starting point for more thorough changes to the General Education program. It ensures that all students will have to discuss issues of race and identity for at least one semester. Overall, The Blackprint welcomes this rigorous and thoughtful approach to addressing racism at AU. For too long, “diversity” and “inclusion” have been empty buzzwords, often lacking substance on the university’s part. AU is infamous for its dialogues and town halls in response to issues, but the time for just talking about racism is over. While we remain cautious, we are also optimistic about the plan’s prospects. We look forward to reviewing the first annual report on its progress.